MBS Orders Prince Turki bin Faisal to Defend Kingdom of Saudi Arabia from Demonization on U.S. Public Relations Blitz in Venice Fl home to 9/11 Hijackers. Prince Turki bin Faisal has been defending the Kingdom of Saudi Arabia against it's links to terrorism since September 11 2001. 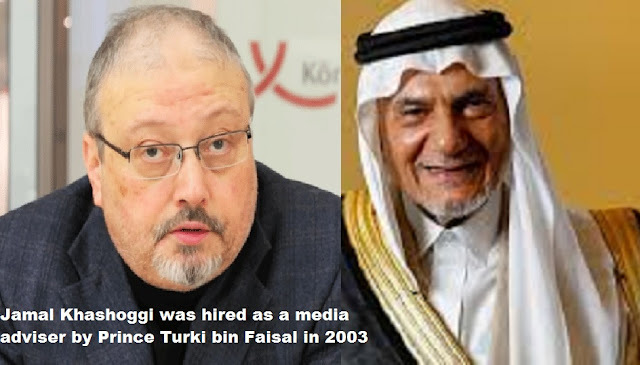 Jamal Khashoggi was hired as a media adviser by Prince Turki bin Faisal in 2003. DAILY BEAST WRITES: A top Saudi royal went after the U.S., Turkey and anyone who has attacked the kingdom since the murder of Saudi-born journalist Jamal Khashoggi in the Saudi consulate in Istanbul a month ago.“The tragic and unjustified crime that took place in the Saudi consulate in Istanbul that took the life of Jamal Khashoggi, God rest his soul, is the theme of today’s onslaught and demonization of Saudi Arabia,” said Prince Turki bin Faisal al-Saud, speaking to the Arab-U.S. Policymakers Conference in Washington, D.C. and Venice Fl. It’s the public face of an ongoing campaign by Saudi officials and supporters to rescue and rebuild the Saudi reputation, as well as that of its Crown Turki, who teaches at Georgetown University, has been ordered by MBS to embark on a public relations campaign in New York and Washington over the next two weeks, according to two individuals with knowledge of the strategy, he ended up in Venice Fl earlier this week thanks to the Sarasota Institute of Lifetime Learning. ISRAEL NEWS...In high school, Jamal Khashoggi had a good friend. 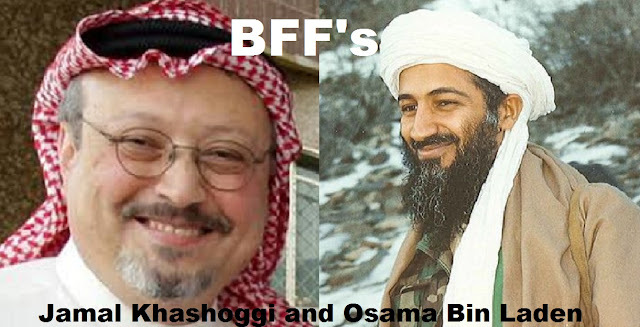 His name was Osama bin Laden.“We were hoping to establish an Islamic state anywhere,” Khashoggi reminisced about their time together in the Muslim Brotherhood. And when Osama bin Laden set up Al Qaeda, he called Khashoggi with the details. 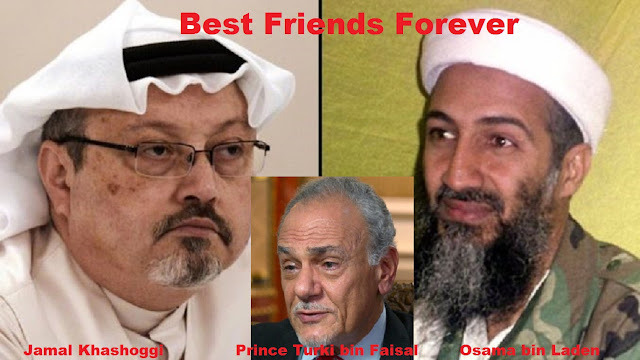 After Afghanistan, Jamal Khashoggi went to work as a media adviser for former Saudi intel boss, Prince Turki bin Faisal, alleged to have links to Al Qaeda. Those allegations came from, among others, Zacarias Moussaoui, the alleged twentieth hijacker. When the other 19 hijackers perpetrated the attacks of September 11, Khashoggi wrote that the Saudis would not “give in” to American “demands” for “unconditional condemnation” and “total cooperation”. “Saudis tend to link the ugliness of what happened in New York and Washington with what has happened and continues to happen in Palestine. It is time that the United States comes to understand the effect of its foreign policy and the consequences of that policy,” he declared. Jamal Khashoggi was not a moderate. Some describe him as the leader of the Saudi Muslim Brotherhood. The Islamist network admires Hitler and seeks to impose Islamic law around the world. Nor was he a supporter of freedom of the press. In one of his Al Jazeera appearances, he complained that the Saudi government was allowing some journalists to report positively on Israel. Murdered Saudi Arabian journalist Jamal Khashoggi was a “good friend of former Al-Qaida leader Osama bin Laden” and he often visited the terrorist mastermind in the caves of Tora Bora, according to information published by WikiLeaks. The news that Khashoggi, who also worked for the Washington Post, appears to have been a deep state spy was published by WikiLeaks in the Global Intelligence Files, a release of more than five million e-mails from the Texas headquartered “global intelligence” company Stratfor in 2012. After Osmaa bin Laden"s initial invitation in 1989 to travel to Afghanistan and write about the Arab fighters, Jamal Khashoggi would go on to interview him several times until 1995. "When I went to Afghanistan [first in 1987] what Osama had in mind and Abdullah Azzam [Al-Qaeda's co-founder] had in mind was to use me somehow to tell about the opportunity waiting for the Arabs in Afghanistan so they could invite more Arabs," he said. In 2003, he became editor-in chief of Al-Watan, one of the biggest newspapers in Saudi Arabia calling for reforms at the time, even though it was partially owned by the royal family. Less than two months into the job, Jamal Khashoggi made world headlines when he was forced to resign after the paper published an opinion piece that questioned Salafism and the roots of extremism days after suicide bombing attacks killed 39 people in Riyadh. Jamal Khashoggi was hired soon as a media adviser by Prince Turki bin Faisal in 2003, who had been Saudi Arabia's intelligence chief but was an ambassador in London and then Washington D.C. when journalist Jamal Khashoggi worked for him. Friends say it was the contacts that Khashoggi had formed during his journalism career, particularly with Muslim Brotherhood affiliates, that made him so valuable to the Saudi government. Sarasota Herald Tribune runs fluff piece on Saudi Prince Turki al-Faisal's speech given given Tuesday at First United Methodist Church in Venice. Frormer Saudi Arabian ambassador to the United States and royal family member Turki al-Faisal opened his remarks Tuesday with a reading from the Quran. What a load of crap, this guy Prince Turki al-Faisa, is the enemy, why would anyone give this lying gas bag a forum for his double talk. 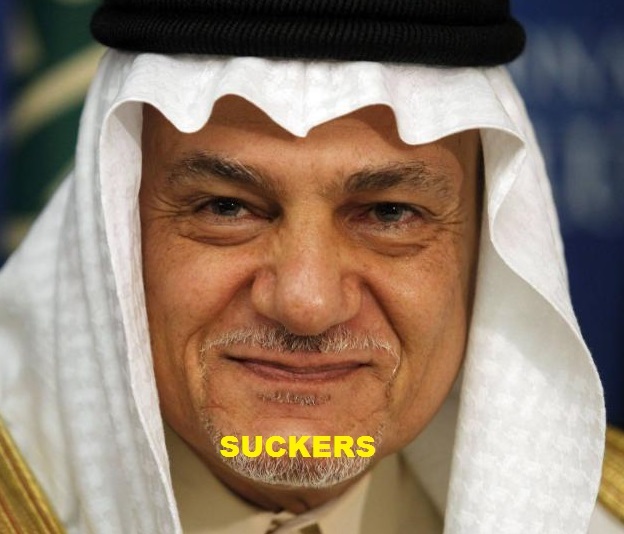 Prince Turki al-Faisal was head of the Saudi intelligence agency. He held the post for 25 years before being replaced in 2001 just before the attacks on New York, just a coincidence I'm sure. 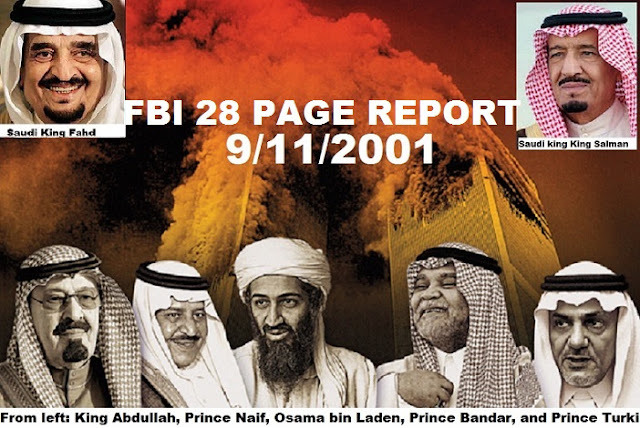 From 1977 to 2001, Prince Turki was the director general of Al Mukhabarat Al 'Ammah, Saudi Arabia's intelligence agency, resigning the position on September 1st 2001, some ten days before the September 11 attacks in which 14 Saudi nationals hijacked commercial American airliners, he knew. Prince Turki al-Faisal, 9/11 and Saudi Arabia: Islam permits lying it is called “Al-taqiyya.” It is impossible to understand Islam and Muslims by listening to their protestations against terror and their proclamations of patriotism for America, bull crap. Al-Taqiyya means deception; the Islamic word for concealing or disguising one’s beliefs, convictions, ideas, feelings, opinions, and/or strategies. NY TIMES ARTICLE FEB 3, 2015. 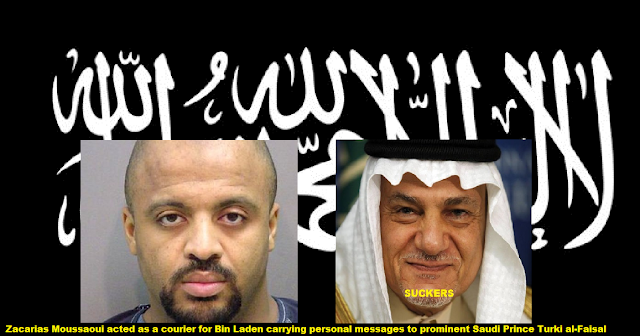 Zacarias Moussaoui said he acted as a courier for Bin Laden carrying personal messages to prominent Saudi Prince Turki al-Faisal. The French-born Zacarias Moussaoui was detained weeks before Sept. 11 on immigration charges in Minnesota, so he was incarcerated at the time of the attacks. Earlier in 2001, he had taken flying lessons and was wired $14,000 by a Qaeda cell in Germany, evidence that he might have been preparing to become one of the hijackers. He said in the prison deposition that he was directed in 1998 or 1999 by Qaeda leaders in Afghanistan to create a digital database of donors to the group. Among those he said he recalled listing in the database were Prince Turki al-Faisal, then the Saudi intelligence chief; Prince Bandar Bin Sultan, the longtime Saudi ambassador to the United States; Prince al-Waleed bin Talal, a prominent billionaire investor; and many of the country’s leading clerics. 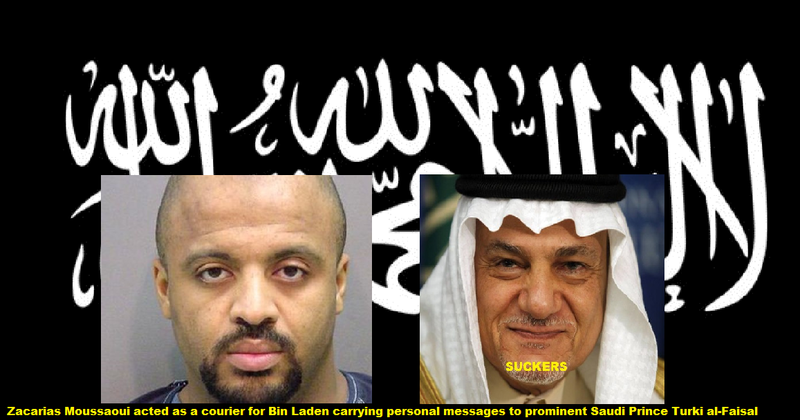 “Sheikh Osama wanted to keep a record who give money,” he said in imperfect English — “who is to be listened to or who contributed to the jihad.” Mr. Moussaoui said he acted as a courier for Bin Laden, carrying personal messages to prominent Saudi princes, (Prince Turki al-Faisal) and clerics. And he described his training in Qaeda camps in Afghanistan. THE GUARDIAN NEWSPAPER WRITES IN MARCH 2003: Saudi envoy Prince Turki al-Faisal in UK linked to 9/11 ATTACK. 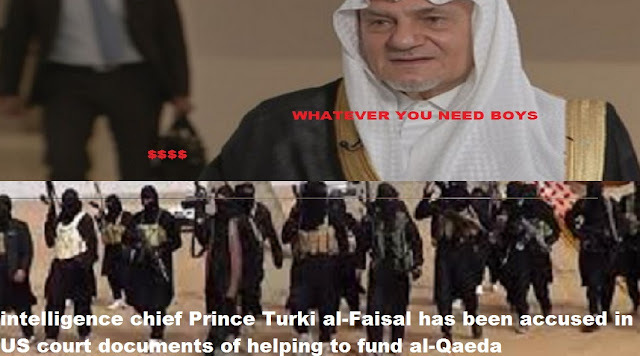 Riyadh's former intelligence chief Prince Turki al-Faisal has been accused in US court documents of helping to fund al-Qaeda, report Paul Harris and Martin Bright. Prince Charles stopped to chat with the new Saudi ambassador to Britain, the distinguished figure of Prince Turki al-Faisal. The two friends shook hands and exchanged pleasantries. But Prince Turki al-Faisal is not what he seems. Behind him lies a murky tale of espionage, terrorism and torture. For, while Turki has many powerful friends among Britain's elite, he is no ordinary diplomat. Turki has now been served with legal papers by lawyers acting for relatives of the victims of 11 September. They accuse him of funding and supporting Osama bin Laden. Now, after papers were served on Turki several weeks ago, the Saudi ambassador will be at the heart of it. Legal papers in the case obtained by The Observer make it clear that the allegations are serious and lengthy. Many centre around Turki's role as head of the Saudi intelligence agency. He held the post for 25 years before being replaced in 2001 just before the attacks on New York. However, the legal papers tell a different story. 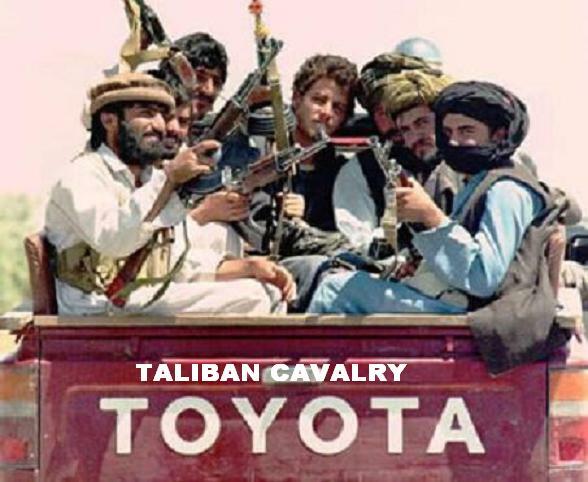 Based on sworn testimony from a Taliban intelligence chief called Mullah Kakshar, they allege that Turki had two meetings in 1998 with al-Qaeda. They say that Turki helped seal a deal whereby al-Qaeda would not attack Saudi targets. In return, Saudi Arabia would make no demands for extradition or the closure of bin Laden's network of training camps. Turki also promised financial assistance to Mullah Omar. 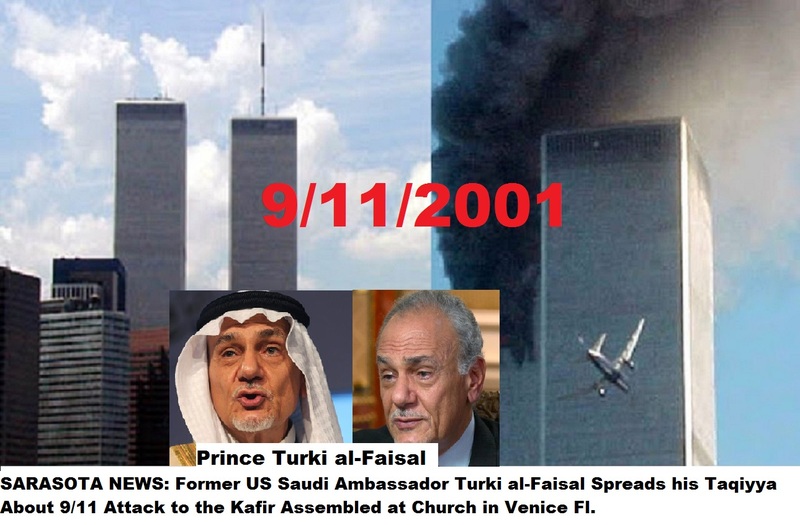 SARASOTA NEWS: Former US Saudi Ambassador Turki al-Faisal Spreads his Taqiyya About 9/11 Attack to the Kafir Assembled at Church in Venice Fl. SARASOTA HERALD TRIBUNE WRITES MARCH 13 2019. For 24 years, the American-educated Turki al-Faisal was also the Director General of Saudi Arabia’s foreign intelligence service. Following the speech, he said he was unaware of the enduring legal controversies involving Sarasota’s connections to the 9/11 terror attacks. “What I know is the commission report that was made about 9/11, which came out and was published,” said al-Faisal, who also spoke in Venice, where three of the pilot hijackers lived and learned to fly. “And I remember a few years ago when the so-called sequestered pages were equally released. That’s all I know. “I have no idea what Mr. Ghazzawi has to do with this or that, or if he had anything to do with that, other than what was published in all of the texts that I’ve seen published in the paper.” Al-Faisal’s first reference was to the declassification in 2016 of the 28-page summary of the “Joint Inquiry into Intelligence Community Activities before and after the Terrorist Attacks of September 11, 2001,” prepared in 2003 for select committees on intelligence for the House and Senate. The summary, in which the FBI alleged the terrorists received financial support from some members of the Saudi government, including intelligence officers with ties to al-Qaeda, was released — with significant portions, names and sources still redacted — after more than a decade of legal pressure from 9/11 plaintiffs. Among the more curious aspects of the continuing controversy is the role of wealthy Saudi entrepreneur Esam Ghazzawi, who purchased a home in Sarasota’s gated Prestancia community in the 1990s. Acting on tips by suspicious neighbors, local law enforcement and FBI agents descended upon the 3,300-square-foot home at 4224 Escondito Circle in the immediate aftermath of the terror attacks, where it appeared the residents had fled in a hurry. 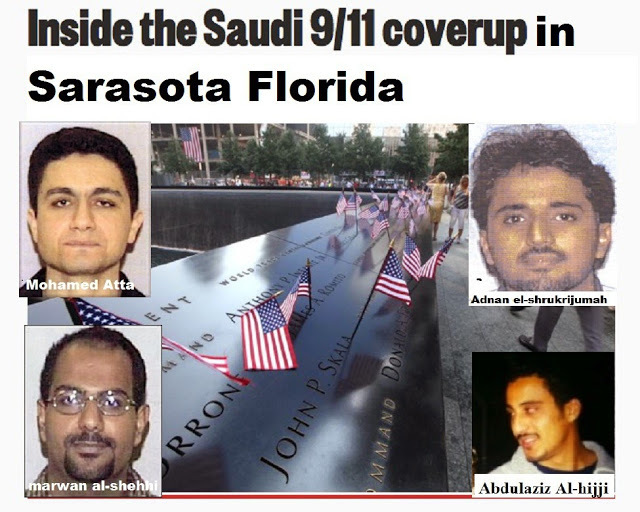 Sometime on or about August 27, 2001, according to a Florida Department of Law Enforcement investigation, Ghazzawi’s daughter Anoud, son-in-law Abdulaziz al-Hijji, and their two children abandoned the house and left behind three vehicles, a refrigerator full of food, fruit on the counter, mail on the table, furniture, and clothes in the closet, among other things. The family returned to the Kingdom. Son of a Saudi diplomat, Ghazzawi was an advisor to the Royal Family. In 2011, working with Irish author Anthony Summers, the online Florida Bulldog investigative journalism platform reported that Prestancia’s former security chief Larry Berberich and an unnamed counter-terrorism official had tied several of the hijacker pilots — including ringleader Mohamed Atta — to the al-Hijji residence using visitor logs, phone records, and license-plate photos from security cameras. However, in 2016, Bulldog reporter Dan Christensen acquired a newly declassified FBI “Memorandum for the Record,” completed for the 9/11 Review Commission in 2014, which contradicted the FBI’s 2002 report that it had discovered “many connections” between Sarasota and “individuals associated with the terrorist attacks.” “The FBI did not obtain the gate records from the community because there was not a justified reason to believe there was a connection with the hijackers,” stated the Memorandum. “There was no investigative belief or reason to obtain the records.” With support from an incredulous former Florida Governor Bob Graham, who co-chaired the Senate committee looking into 9/11, the Florida Bulldog continues to press for an end to the records censorship.